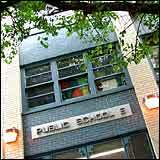 These are among the city’s best public elementary schools, according to the most recent test information available, and independent schools. (Information regarding public middle schools was not available.) Math and reading (English-language arts) scores listed below represent the percentage of students who passed those exams in 2002. Listings are in order of the average of those two scores. Call individual schools for application procedures and deadlines. Looking up: The Sarah Anderson school serves Upper West Side youngsters.